We had a beis hamikdahs where we felt that Hashem was right here with us. But it went away. One reason is that the Jews forgot to keep in mind how special the Torah is and always say a bracha in the morning thanking Hashem for the Torah. Hashem makes us special with mitzvos. One mitzvah is to study the Torah. We ask Hashem to make us all enjoy doing this. And we and our children and grandchildren should all study the Torah just because it’s the right thing to do and good to do. Hashem chose us from all the nations (groups of people who live in different countries) and gave the Jews the Torah. Hashem is called hamelamed – this means that Hashem is the greatest teacher in thw world! Hashem is also called nosein haTorah, the giver of the Torah. Students used the tools of the virtual classroom to draw colorful open and closed Torah scrolls. Students also drew children lighting the menorah. 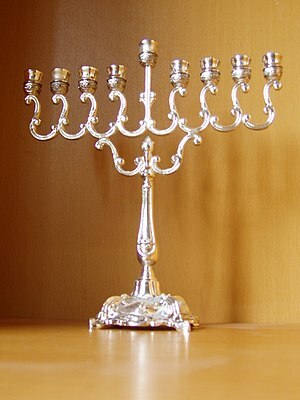 The original menorah had seven brances and stood in the beis hamikdash. In Israel we call the one we light on Chanukah a chanukiah. We began a story by Libby Lazewnik called No Questions Asked. In the story, Aliza has complaints against her mother’s way of doing things in a disorganized fashion, but she also appreciates her mother’s warm and loving personality. Often we are called in many directions and we have to prioritize to decide which direction we will choose. Students decided that taking care of burning food was the most important thing to be done in the story. We have to be very careful around fire. When we light Chanukah menorahs we should roll up our sleeves, not get too close, and not behave wildly near the flames. We should keep an eye on babies and young children, because our parents may be called in many directions. it’s a mitzva to help keep everyone safe. Vocabulary words we discussed were stoic, oblige, recoiled and sympathetically. Spelling words were organized, laundry and directions. Students were very considerate about sharing space on the board. We had an advanced student today, so we did a quick review of the letters with kamatz and then moved on to some unusual vowel combinations such as the chataf patach and chataf segol. Very good question from a student: Why is there sometimes a chataf patach (etc.) in the Torah (instead of just a patach)? What is its meaning? Morah Elana said that she would research this. When Morah Elana said a bracha before she drank a cup of water, two students typed “amen” into the chat box! We wondered if that works as far as being considered as having answered amen to a bracha. We read the word Chanukah. Students drew Chanukah related drawings on the board. We spoke about fire safety around the Chanukah lights. It’s a mitzva to protect our safety – venishmarten meod lenafshoseichem. We talked about Parshas Mikeitz. Pharoh had two strange dreams. His wise men and magicians explained them, but Pharoh did not like their explanations. Yosef, who was known to be good at explaining dreams, was called to Pharoh – but was first given a haircut and clean clothes to stand before the king. When we daven we are standing or sitting before Hashem so we make sure to dress neatly and appropriately. Yosef didn’t know that he would be taken out of jail suddenly. Sometimes we have difficulties but Hashem can make things better in an instant. When Pharoh complimented Yosef for being able to explain dreams, Yosef did not brag or act like a big shot and say that he was the greatest. He said that Hashem is the One who understands everything, and maybe Hashem will make him thik of the right explanation. Yosef’s explanations made sense to Pharoh. Pharoh chose Yosef as the wise person to collect and save food during the seven years when there would be extra, and give it out when there would not be enough food. Yosef’s own brothers went to Mitzrayim to get food but Yosef pretended not to know them. They did not recognize Yosef after all the years they had been separated. Students drew Yosef storing a lot of food for the future. Yosef explained that the reason that Hashem showed Pharoh the dreams was so that he could prepare for the future – he could do something about it and not just let things happen. In Peanut Butter and Jelly for Shabbos, Laibel and Yossi managed to prepare an entire Shabbos meal. They met the challenge and saw that Hashem made them able to succeed. Studnts and Morah Elana discussed challenges we faced, and how we tried to do our best. Hashem helped us succeed! We began reading Laibels for Laibel. Sharing can be something we don’t want to do, but it’s not nice to live ina family when we keep everything for ourselves. We talked about things we share and drew pictures that represented sharing.